Wat Arun is the oldest Buddhist temple located in Bangkok District Ya. Unlike most temples in Bangkok, Wat Arun has a unique architectural style. You will not find a wall of gold here because almost all the walls and towers of Wat Arun temple are covered in porcelain and colorful ceramics from China. To get into the Wat Arun complex, you need to pay a ticket for 50 THB. Interestingly, there are a lot of souvenir shop sellers who offer their wares in Indonesian and receive payment in Rupiah. So, do not miss this unique experience while visiting Wat Arun, yes! Tired of visiting various tourist attractions in Bangkok, it's time you rest while enjoying good food at Chocolate Ville located in the area of Navamet Cassette. Chocolate Ville is a tourist destination that offers a different culinary experience than most places. When you get here, you will feel the atmosphere in a small European countryside. About the price, the food at Chocolate Ville is still quite affordable. The menu offered was varied and delicious. Even if you do not want to eat, there are so many beautiful spots that can add to your photo collection. You also will not feel a loss to visit here because it will not be charged alias free. For contemporary art lovers, try stopping by the Bangkok Art & Culture Center. This open-air art gallery stores a collection of Thai and international artists. In addition to art, this tourist place also showcased a variety of designer collections, sculptures, music, theater, and movies that can be enjoyed for free. Bangkok Art & Culture Center is well worth a visit as it has a futuristic modern architecture and interior. On the outside of the building, there is an interesting installation artwork to be used as a photo object. Bangkok Art & Culture Center is open daily except Monday, 10:00 - 21:00. SEA LIFE Bangkok Ocean World is at the bottom of Bangkok's most popular mall, Siam Paragon. One of the largest aquariums in Southeast Asia has a collection of marine animals and fresh water is complete enough, so it is suitable to be a family educational tourist destination. To be able to enjoy it, you will be charged 990 THB and 790 THB for children above 3 years old. For those who want an unforgettable experience, SEA LIFE Bangkok Ocean World offers a variety of attractions and activities. One of them, diving with sharks, enjoying the underwater world with an ocean walker, watching 4D cinema, to see the staff feeding the fish. When interested, any activity will incur additional costs vary. Planet dinosaurs are more than just a choice of tourist destinations. A theme park is also a complete educational center in Southeast Asia. Located on Sukhumvit Road, Phrom Phong, Dinosaur Planet entrance fee is 600 THB for adults. Planet dinosaurs fall into seven areas. You can learn about dinosaurs through multimedia technology in the Dinosaur District, watch hatching eggs at Dino Lab, to see the skeletons of Brachiosaurus, Triceratops, and Stegosaurus in the Big Bone Gallery. Not only that, you can also enjoy dinosaur shows in The Great Volcano & The Extinction Show. 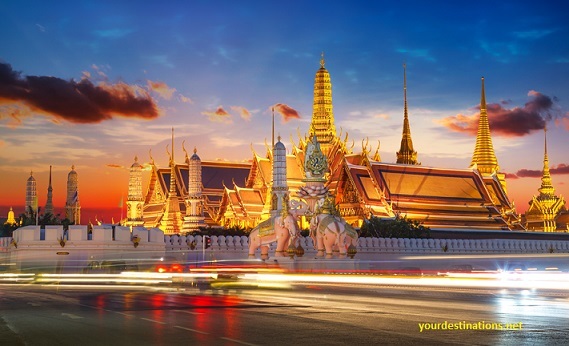 Bangkok is one of the shopping paradises in Southeast Asia. For those who do not want to jostle in the market, you can visit Asiatique The Riverfront on the banks of the Chao Phraya River. This place has hundreds of outlets that sell all the needs of the urban at an affordable price. After tiring of shopping, you can relax and enjoy the delicious, enhanced menu with panoramic views of the Chao Phraya River. Not only that, the Asiatique The Riverfront also has an interesting place of entertainment, such as Bangkok Eyes monument, Juliet Love Garden, to the show Calypso Ladyboy Cabaret. Well, that's a list of recommendation sights in Thailand for you visit the yourdestinations.net. Which tourist attractions appeal to you most? Share Please!